One day, I happened by a selection of Boca’s garlic veggie burgers on clearance at the grocery. 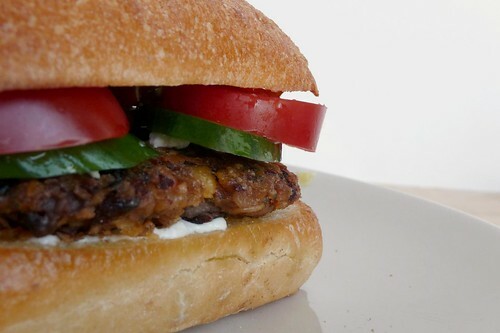 I’d always wanted to try a veggie or bean burger, so this seemed like a good way to start off. It wasn’t bad, fairly flat and bland and much like any other fully-cooked, heat-and-eat burger you’d find in the freezer. Clearly, my best bet for a good veggie burger would be to make it myself. But time passed, as time does, until I got a batch of veggie burgers from a friend who decided to try making Guy Fieri’s recipe. She didn’t like them very much (muttering something about too much bean) but asked if I wanted to try them anyway. Never one to turn down free food, I fried one up for dinner that night and was immediately hooked. For an easy, fast vegetarian dinner, these can’t be beat. I doubled the recipe so I didn’t have random half cans of beans hanging around the fridge and so I’d get about four dinners for two out of 20 minutes work. This is one of my “emergency” meals — meals I can pull out of the freezer and get dinner on the table in under 30 minutes with a minimum of fuss and muss. And if you’ve got a diehard carnivore in your life, don’t worry — these puppies taste great and even better with a couple of slices of bacon on top. Over moderate heat, saute raw vegetables (not beans) in 1 oz olive oil until browned on the edges. In a large bowl, mix cooked veggies with beans and spices. Add in dry ingredients and egg, mixing thoroughly. Form into patties and chill for 30 minutes before cooking. Patties can be wrapped in plastic and frozen too, just defrost them in the fridge first. To cook, add an ounce of olive oil and fry patties for 2 – 3 minutes per side. My favorite way to serve these: Top with a generous sprinkling of crumbled feta or chevre and sliced red onion, place on a toasted foccacia or ciabatta bun with a schmear of garlic sauce or garlic aioli. I’m always varying the beans I use for this recipe. If I have enough beans from the pot I cooked up earlier in the week, I often use those. Otherwise, I pick out whatever looks good in cans at the store — you can’t go wrong, really. If you want to use dried beans, use 1 1/2 cups total of dried beans. This entry was posted in american, dairy-free, gluten-free, recipes, untranslated, vegetarian. Bookmark the permalink.